India and Israel on Tuesday jointly called for resolutely opposing the menace of terrorism and the defeat of this global scourge.Jointly addressing the media here along with Israeli counterpart Benjam Netanyahu ahead of a one-on-one dinner between them, Prime Minister Narendra Modi referred to his visit to the Yad Vashem Holocaust memorial museum shortly after his arrival here earlier in the day and said the museum was "a tribute to your unbreakable spirit to rise above the depths of tragedy, overcome hatred and forge ahead to build a vibrant democratic nation". "Yad Vashem tells us that those who believe in humanity and civilised values must come together and defend it at all costs, Modi said. "As such, we must resolutely oppose the evils of terrorism, radicalism and violence that plague our time. "Modi arrived in Tel Aviv on Tuesday afternoon in what is the first ever prime ministerial visit from India to Israel. 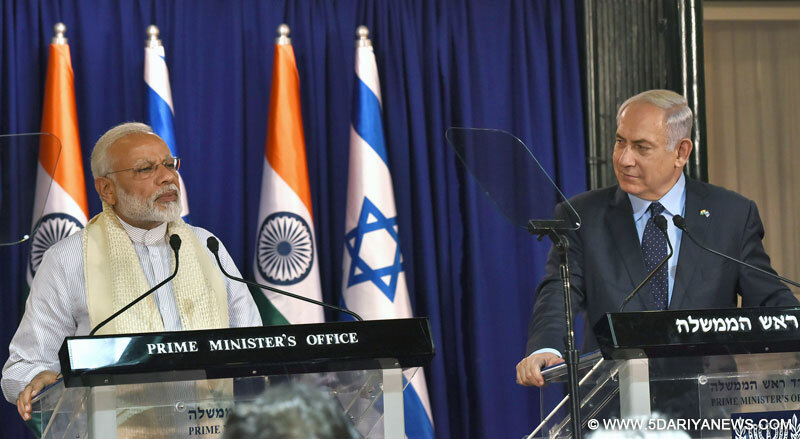 This year marks the 25th anniversary of establishment of diplomatic ties between the two countries.Stating that India-Israel ties have seen rapid growth since the establishment of full diplomatic relations, Modi said: "Common objectives of economic prosperity, strong technology and innovation ties and the need to secure our societies define the space for convergent action between us. Over coming decades, we want to frame a relationship that transforms the landscape of our economic engagement." He said that focus on using technology and innovation to meet development priorities "provides productive scope to expand our academic, scientific and research, and business links". "We also want to put in place a robust security partnership to respond to shared threats to our peace, stability and prosperity," he stated. "I will work with Prime Minister Netenyahu to craft and build a clear action agenda to realise these objectives." eferring to people-to-people links between the two countries, Modi said that Jews have thrived in India for thousands of years after the first of these people landed on India's south-western coastline. "We are proud of jewish sons and daughters of India like Lt. Gen. J.F.R. Jacob, Vice Admiral Benjamin Samson, master architect Joshua Benjamin, and film actors Nadira, Sulochana, and Pramila whose diverse contributions have greatly enriched the fabric of Indian society," he said. "Indian Jews are a living and vibrant connect to this shared history. My visit to Israel celebrates this ancient bond between communities across both our nations. On his part, Netanyahu said that India and Israel were "sister democracies" and faced the common challenge of terrorism.Calling Modi as "friend Narendra", Netanyahu said that Israel believed in the "partnership of intelligence". "India and Israel are sister democracies. We are unequal in size but equal in spirits," said Netanyahu. "We also face common challenges and first of it is to defeat the forces of terror that's on rampage through the world and threaten both our countries. We must stand together in this battle. We have to defeat terrorism. "Netanyahu said both India and Israel shared "a bond of democracy, creativity, a deep respect for the past and a boundless optimism for future and it's in this spirit my friend Narendra, I welcome you here". Speaking of his "great admiration" for people of India for talent and Prime Minister Modi for yoga, the Israeli Prime Minister also recalled Indian mathematician Srinivasa Ramanujan. "We have great admiration for people of India. My late uncle who was a mathematician told me many times about his admiration for great Indian mathematician Ramanujan, who was perhaps the greatest mathematician in many centuries," said Netanyahu. "This symbolises talents of people of India," he said. He further added, "We believe in the partnership of talent. It won't happen over night, but we both want it to happen overnight."